Suzanne Rozdeba A police car outside of the Wald Houses after gunshots back in January. 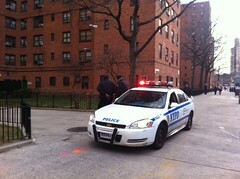 A man walked into Bellevue Hospital with a gunshot wound to his right leg around 1 a.m. this morning, the police said. The victim refused to provide a description of the person who shot him in the vicinity of Avenue D and East Sixth Street, due to what a police spokesperson said was his uncooperative nature. In January, gunshots were heard in the same area near the Lillian Wald Houses, a month after a 19-year-old was shot in the leg further up Avenue D, in the courtyard of Campos Plaza II. Know anything else? E-mail us. Suzanne Rozdeba A police car at East Fourth Street and Avenue D.
Two gunshots were fired in the Lillian Wald Houses at around 2:45 p.m., a convenience store employee told The Local. A pair of police officers were lingering at the entrance to the Lillian Wald complex at East Fourth Street at around 4 p.m., but would not comment, citing an ongoing investigation. An employee at the nearby Ave. D Candy Store, Ahmedou Ould-Dahya, also told The Local he heard a pair of gunshots. A spokesman for the police department did yet not have any information on the possible incident.